I’ll get right to the point. I’ve developed a model for direct outreach marketing that shows you how to get more conversations and meetings with prospective clients by turning cold calls into hot calls. In marketing, there are two very important factors that get more response to your outreach: Affiliation (they know you through some connection) and Information (they are familiar with your ideas). If you reach out to people you’re affiliated with and if you provide good information, you have a better than even chance of getting meetings and landing new clients. Cool, right? The vertical axis is information and the horizontal axis is affiliation. 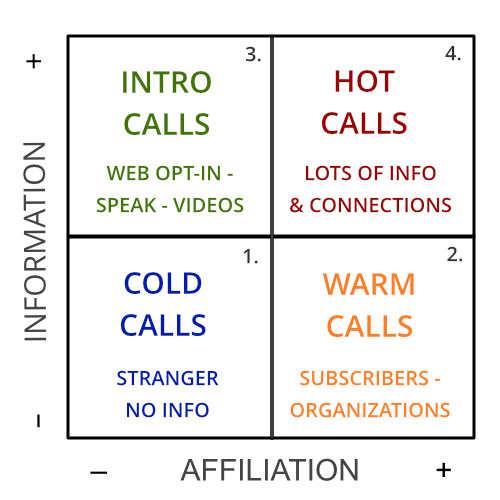 Quadrant 1: Cold Calls. When you have weak affiliation and little information it’s hard to get anyone to pay attention to you; it’s even harder to turn them into a client. You’re a complete stranger, and there’s zero trust or warmth. This is the land of very chilly cold calls and it often comes with a lot of rejection. And in my opinion, it’s a total waste of your time. Quadrant 2: Warm Calls. Here you have some affiliation. You belong to an organization, know people from networking, or have subscribers on your e-list. These people are much easier to connect with because of that affiliation. Now you’re in the land of warm calls, and suddenly you stop getting rejected so frequently. Quadrant 3: Intro Calls. In this place, your prospective clients have previously received some information from you. Perhaps they visited your website and opted-in. Or they attended a talk or saw your video on YouTube. When prospects have this information it’s a lot easier to reach out and introduce yourself personally. Quadrant 4. Hot Calls. Now you’re firing on all cylinders. This is when you’re affiliated and also provide information. Trust and liking are elevated. When you reach out, prospective clients are very open to speaking with you. Your calls are hot and meetings are much easy to get. The one thing to remember, however, that many people conveniently forget, is that you still have to reach out. You still have to ask for conversations and appointments. Learn how to do that and you’ll get more meetings that turn into more clients.